Billionaire genius Genoa Greeves never got over the shocking death of her favorite teacher, Bennett "Dr. Ben" Alston Little, murdered execution-style and stuffed into the trunk of his Mercedes-Benz. No arrests were ever made, no killer charged for the brutal crime. Fifteen years later, the high-tech CEO reads about another execution-style murder; this time the victim is a Hollywood music producer named Primo Ekerling. There is no obvious connection, but the case is eerily similar to Little's and Genoa feels the time is right to close Dr. Ben's case once and for all--offering the L.A.P.D. a substantial financial "incentive" if justice is finally served for Little. Lieutenant Peter Decker resents having to commit valuable manpower to a fifteen-year-old open case simply because a rich woman says "Jump " Still, the recent murder of Primo Ekerling does bear a disturbing resemblance to Little's case, even though two thug suspects are currently behind bars for the Ekerling murder. Decker can't help but wonder about a connection. His first phone calls are to the two primary investigators in the Little case, retired detectives Calvin Vitton and Arnie Lamar. Lamar is cooperative, but Vitton is not only reluctant to talk, he winds up dead of a suspicious suicide twelve hours later. Plunging into this long-buried murder, Decker discovers that even though the two slayings are separated by a decade and a half, there is still plenty of greed, lust, and evil to connect the dots. Decker's team of top investigators not only includes his favorite homicide detectives, Scott Oliver and Marge Dunn, but also his newly minted Hollywood detective daughter, Cindy Kutiel, whose help proves to be invaluable. His wife, Rina Lazarus, continues to be his backbone of support, offering a cool, rational outlook despite her growing concern for her husband's welfare and safety. Rina's worries and fears begin to build at a fevered pitch as past and present collide with a vengeance, catapulting an unsuspecting Peter Decker closer and closer to the edge of an infinite dark abyss. 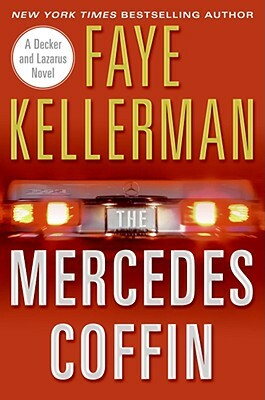 A relentlessly gripping tale spun by a master, Faye Kellerman's The Mercedes Coffin races through a dangerous urban world of fleeting fame and false dreams, making heart-pumping hairpin turns at each step of a terrifying journey, where truth and justice are fine lines between life and death.